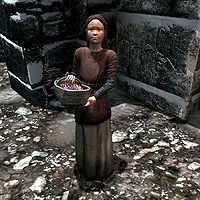 Sofie is a Nord child who wanders around the streets of Windhelm selling flowers from her flower basket. Starting her day at 8am, she sells her flowers for nine hours until 5pm. After that, she finally rests and can usually be found sitting near the New Gnisis Cornerclub. After three hours, she heads back to the barrel at the back of Niranye's house and sleeps until 8am. She will then repeat her schedule the following day. When she spots you during the day, she will approach you and ask "Would you like to buy some flowers? Please?" If you answer positively and ask what she has, she'll tell you "Not much. But I hope you like them!" and a standard merchant menu will open up. Alternately, you can either politely decline or rudely dismiss her, to which she'll answer "Oh, I... okay. Sorry." Regardless of your choice, you will have an option to ask her what she's got for sale the next time you talk to her, as well as an option to ask about her parents' whereabouts. If you inquire about her parents, she'll inform you "They... they're dead. My mama died when I was little... I... I don't remember her very well. My father was a Stormcloak soldier. One day, he left and... didn't come back. I'm all alone... I... I try to sell flowers so I can buy food. It's not much but... what else can I do?" You will then have a dialogue option to adopt her. You can only go through with the adoption if you have a house with a child's bed and container. If you do not adopt her, she will exit the conversation with "Thanks... Thanks for talking to me." With the Merchant perk, she also sells flower baskets. After adopting Sofie when trying to give her a gift all the options may be gray and the message "Item Is Too Heavy Too Carry" appears in the top-left corner. This is because she still has all her flower baskets on her from before you adopted her. If you have the Merchant perk unlocked, make sure to purchase all of her flower baskets before adopting her, to keep this problem from occurring in the first place (your only option if you do not have access to the console). To fix this simply open the console and select her with the mouse, then use the command drop 000d955a 500 to force her to drop all the remaining baskets. They stack so only 1 basket will appear, with the total number after the name. If she does not drop any baskets after using this command, make sure the refID of your selected target is xx004031, as it is common to accidentally click the wrong asset when using click targeting. When you tell Sofie to go to bed and relent when she says it's not even dark outside instead of insisting she go to bed anyway, she may say "Thanks, pa", even if you're playing as a female character. When you adopt Sofie, she may tell you that she will collect her things and meet you at the house, but then remain in Windhelm and not move, even if you approach her repeatedly. A possible fix is to have a separate house with a room for a child, and tell Sofie to go there. Find her once again at that separate house, and then tell her to move to your Hearthfire house. She will appear at the manor some time later. To fix this, stand inside your manor and use the console command prid xx004031 to select her, followed by moveto player to move her into the manor. If you've adopted Sofie before capturing Windhelm for the Imperials, she may disappear after you've captured Windhelm. ? A possible fix is to speak to another family member and have them move to another home. Sofie should appear in this new location. This page was last modified on 23 July 2015, at 18:08.